Whether you sold Krispy Kremes as a kid to raise peewee team funds, waited (sort of) patiently for years until the chain hit your town, or have a habit of looking for the Hot Now sign to light up (now, there's an app for that! ), there are still probably a few things about the almost 80-year-old company and its famous glazed doughnuts that you don’t know. 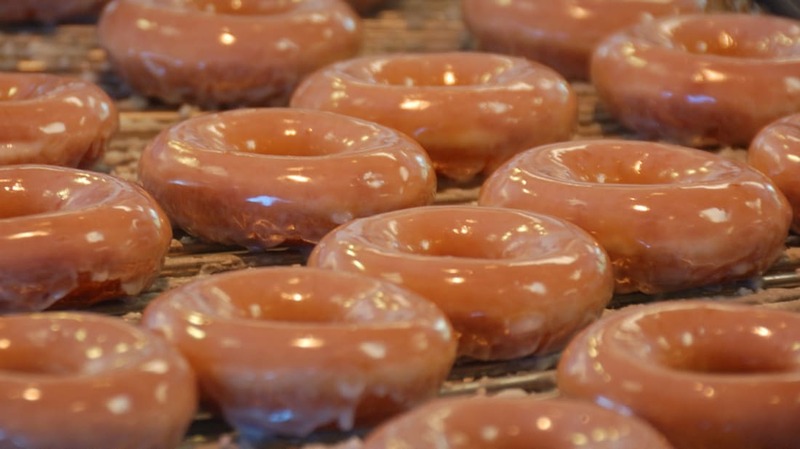 Though their baking methods are fair game, the top-secret recipe for Krispy Kreme doughnuts is kept in a vault in the company’s Winston-Salem, N.C. plant, which also manufactures "the same dry mix used in the 190 Krispy Kreme stores around the country," The Chicago Tribune reported in 2001. Once a store has its stock of the special mix, doughnuts are prepared on-site using purified water and special yeast that’s from North Carolina, too. Then, "an air-pressurized extruder produces the perfect doughnut shape and gives the pastries a head start on puffiness," the doughnuts rise for half an hour, and finally they’re "fried in vegetable shortening on both sides before being covered in a warm sugar glaze." Krispy Kreme takes this process quite seriously. In 2010, the company waged battle with the owners of a New York franchise location, charging them with baking treats from their own recipe and ingredients after Krispy Kreme had stopped its supplies, and with supplying the unofficial doughnuts to an "alleged 'rogue' operation" across the river in New Jersey. 2. ... AND WE MAY HAVE AN OHIO RIVER BARGE COOK TO THANK FOR IT. According to the Duke Chronicle, Krispy Kreme founder Vernon Rudolph most likely got his prized recipe from Joseph G. LeBoeuf of Louisville, an Ohio River barge cook who "was famous for three things: his flapjacks, his coconut cakes, and his light and fluffy doughnuts." After Rudolph had joined his uncle Ishmael Armstrong in Paducah,, Kentucky and before Rudolph set up his first doughnut shop, the two "probably admired the recipe [...] and LeBoeuf would have been flattered to share it—no secret transactions involved." As far as the Krispy Kreme family and historians can work out, the original recipe likely "consisted of a cream (the eponymous ‘Kreme’) of fluffed egg whites, mashed potatoes, sugar, shortening and skim milk that was chilled and mixed with flour and then fried and covered in glaze." 3. TODAY, YOU CAN BUY ONE IN QATAR (OR 1002 OTHER LOCATIONS). Founded in 1937 in Winston-Salem, North Carolina, Krispy Kreme now has 1003 locations (including franchisee-owned ones) and operates in such countries as Bahrain, Canada, Colombia, Dominican Republic, India, Indonesia, Kuwait, Malaysia, the Philippines, Puerto Rico, the Republic of Korea, Taiwan, Thailand, Turkey, the UK, and the United Arab Emirates—24 countries in total. 4. A NEW STORE’S OPENING CAN CAUSE A HUGE GLAZE RUSH. If your town’s had Krispy Kreme stores around for a while, you might have forgotten what life was like without them, or just how crazy fans of the doughnuts can go when they finally arrive. When the first Las Vegas location opened in 1998, it sold 72,000 doughnuts the first day and 360,000 by the end of its first week, leading to some serious fan traffic. In the following years, many more lucky U.S. cities made the list of Krispy Kreme locations, and the title for “highest first-day sales” was passed around. However, the people of Perth, Australia most recently took the honor for themselves, raising the first-day bar right over 73,000. On November 26, 2014, the Krispy Kreme fans of Perth "won the illustrious world record for most doughnuts purchased on the first day of Krispy Kreme trade, replacing the city’s unofficial world record for most Krispy Kremes smuggled on to a Jetstar flight," Australia’s The Sunday Times wrote. Between its 9:30 a.m. opening time and midnight closing, the store moved a full 73,200 doughnuts. 5. CELEBRITIES GO CRAZY FOR THEM, TOO (INCLUDING PRESIDENT OBAMA). In 2012, President Barack Obama and his crew were spotted casually visiting a Krispy Kreme location in Tampa, Florida. The president strolled in, picked up three dozen doughnuts to share with a nearby firehouse team, chatted with workers and customers, and bought a little boy some powdered doughnuts. And President Obama is just one high-profile fan of the chain; lots of other famous faces, including Elvis Presley, have been caught tucking into their doughnuts over the years. 6. THE KRISPY KREME BUSINESS BOOK READS … WELL, A LOT LIKE FAN FIC. The book Making Dough: The 12 Secret Ingredients of Krispy Kreme’s Sweet Success gives some insight, perhaps, as to why some fans of the chain are so very passionate about its doughnuts. Despite all of the other sensory pleasures, the climax of the Krispy Kreme experience doesn’t come until you get that hot doughnut in your mouth. … Is a Krispy Kreme like sugar-encrusted air? … Fifty-nine cents of pure pleasure? … Unbridled ecstasy? … Some people devour the hot treat and moan as the last bite slips down the throat. … Some let the powerfully tasty doughnut possess them; their heads loll and their eyes roll at the taste. Others have even cried in joy at the taste, tearing up like a happy bride and groom on their wedding day. Of course, there’s actual fan fic about Krispy Kreme, too. Those who’d rather eat the treats than read or write about them can become "Friends of Krispy Kreme" in the UK (and get a free doughnut for it), and there’s a U.S. fan club that sends out promos. Bring in Krispy Kreme's "Double Hundred Dozen" box to your morning meeting and you’ll wind up with 2400 Original Glazed and, most likely, some very happy coworkers (though they might need naps later in the day). 8. ... BUT IT WON’T BREAK THE WORLD RECORD OF 2700 IN ONE BOX. The standing Guinness World Record for largest box of doughnuts is the Krispy Kreme box created by The Kuwait Food Co. Americana in 2009. The enormous cardboard box, an exact replica of a normal-sized one (including specially made labels), was around 19’ x 13’ x 3’, weighed almost 300 pounds, and contained 2700 Krispy Kreme doughnuts. 9. KRISPY KREME WEDDING CAKES HAVE BEEN ALL THE RAGE FOR AT LEAST A DECADE. If nothing will do on your special day but a tower of doughnuts, you’re in luck: various locations, including those managed by Krispy Kreme UK, offer customized corporate spreads and ones designed for weddings, too, including cake-like doughnut towers and individual boxes bearing the happy couple’s names. In 2004, one Washington couple tried to set the world record for tallest doughnut cake at their wedding, and reportedly submitted the 5'3" results to Guinness (no word on whether or not Guinness decided to create the category, or if a doughnut-based bribe was involved). 10. THERE WERE ALMOST DOUGHNUT SMOOTHIES AND MILKSHAKES. In 2004, Krispy Kreme briefly offered a doughnut smoothie, which one journalist described as offering an experience "similar to that of an 8-year-old who’s found the box of C&H brown sugar while his parents were gone," or to squeezing a tube of frozen cake frosting "directly down your throat." In 2011, deathandtaxes reported that the company tested out doughnut shakes in Original Glazed, Chocolate Cake and Raspberry Filled flavors in five North Carolina stores. Unfortunately, it looks like neither idea caught on nationally. 11. THE COMPANY HAS PAID TRIBUTE TO PIRATES AND THE ORIGINAL GHOSTBUSTERS. To celebrate Ghostbusters's 30th anniversary, stores sold marshmallow Kreme-filled doughnuts sporting the film’s "splat" logo and the Stay Puft Marshmallow Man’s mug. And on September 19, a.k.a. Talk Like a Pirate Day, spouting some pirate-isms to a Krispy Kreme employee will earn booty in the form of one free doughnut.